I have only owned two bicycles in my life, and I owned them 20 years apart. No joke. I bought my first bike when I was in college, enjoyed one glorious ride, and then it was stolen two days later (CUE SAD TROMBONE). Over the last decade, despite Jon's repeated encouragement, I have since (rather stubbornly) resisted owning another bike, both due to my bike theft trauma and also because of cost. And then I learned about Priority Bicycles. Priority Bicycles reached out to me late last fall about trying out their bike, and I know it sounds crazy, but I was still somewhat resistant because I didn’t want to own another bike and have it get stolen two days later (ridiculous, I know, but still!). However, after some contemplation -- and a really lovely exchange with founder David Weiner, who personally helped with product recommendations -- I decided to get over myself and try their (super adorable) ladies' step-through bike. I will admit that I’ve fallen into a pattern of having Jon handle anything requiring fixing and assembling. My brain typically isn’t suited to processing instructions. But when the bike arrived, I decided I wanted to try putting it together. And while the instructions do advise you to have a professional review your bike assembly, I found the instructions to be straightforward and simple, and I'm not sure I can begin to convey how empowering it was to assemble the bike then take it for a ride. The bike rides well and comfortably and it was easy to get used to the internal (reverse pedal) braking system. My bike arrived about a week before the onslaught of snow, and during that week I went bike riding with Laurel twice. Biking has been her and Jon’s activity and to be able to do something new and physical with Laurel was amazing. I actually had tears in my eyes as I rode behind her that first time, with Laurel leading the way and showing me the loop she usually does with Jon. I'm the kind of person who needs some kind of physical activity every day (or else I go crazy and cranky) and I love that biking now offers a way Laurel and I can do something active together. Now that the weather is finally warming up, I am seriously excited about being able to bike to do errands when I don’t want to use the car, but don’t quite have the time to walk. Priority’s bicycles are pre-drilled to accommodate a bunch of different accessories. After enjoying my pre-snowpocalypse rides, I ordered their U-lock, back rack, and cargo net. I am ready to do all the errands! Also cool for parents who want to ride with little ones, they have a Peg Perego rear mounted seat. As I mentioned earlier, in addition to my bike theft trauma, a related bike barrier for me was cost. On the couple of occasions I have visited bike stores (to get gear for Laurel), I’ve looked at the price tags and been completely overwhelmed by the idea of spending close to $1,000 (or way more!) on a bicycle that, well, might get stolen in my urban neighborhood. 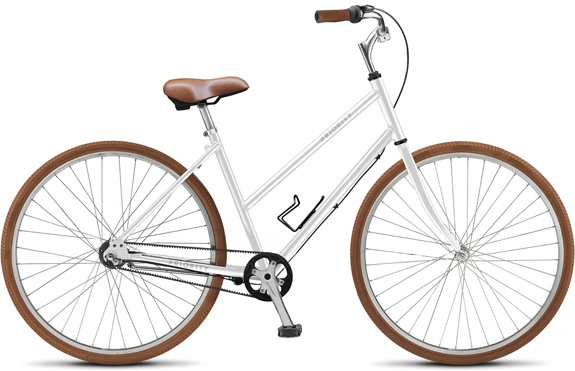 Priority Bicycles run just under $400, which I didn’t even know was possible for an adult bike. So, basically, though I will do all I can to protect my ride, even if it got stolen tomorrow, I know I could order a new one at a reasonable price. So, if you’re looking for a bicycle, definitely check out Priority! Given that the forecast is calling for a string of 60+ degree days starting Sunday, my bicycle is coming out of hibernation this weekend. And you can be sure I’ll be locking it up at every turn. Disclosure: Priority Bicycles kindly sent me a bicycle to test out for editorial consideration. All thoughts and opinions are, of course, my own.